I love Emeril too, you are right, his recipes are always so flavorful. I really need to remember to make more of them. I love red beans and rice. Definitely something I need to make soon! Just a big bowl of comfort food. 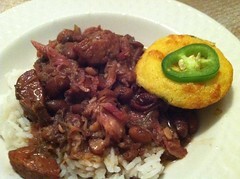 A New Orleans classic and a great Emeril recipe. I had the pleasure of meeting him and could feel how genuine he is with his love of food. Gotta love Emeril recipes. This looks so comforting, and just perfect for winter! I need to make more real southern recipes and Emeril is always a go to. Thanks for sharing another great recipe!! I love Emeril too, but often find I need to make his recipes a little more diabetic-friendly. Can’t go wrong with red beans & rice! I have been to 2 of Emeril’s restaurants, but never made one of his recipes. I think I have to change that. I’ve never had beans & rice but yours looks delicious! So hearty, wholesome and fiber-ific 😉 And you had me at cornbread, one of my favourite sides of all time! I’m kinda obsessed with cornbread right now. Made the jalapeno batch this week, then made Maple Chipotle Cornbread to go w/ Veggie Chili for lunxh today. It’s been years since I’ve had red beans and rice! I’ve got to try Emeril’s version! Thanks for sharing! I love dishes like this for a cheap weekday meal. Stick in the slow cooker and enjoy later is my kind of busy day meal. This is not just rice and beans. It sounds so incredibly flavorful! mmmm…. I love read beans and rice. It’s snowing on your blog. How cool is that? New Orleans is also my favorite city! We ate at Emeril’s last time we were there. Amazing all around. I love this simple, cheap and authentic recipe. Thanks for sharing! YES!!!! Someone did red beans and rice!! LOVE this!! !